This handsome high quality three in one Texas Hold’em Tabletop is the right item choice for those who are looking for a practical, and portable poker table top. 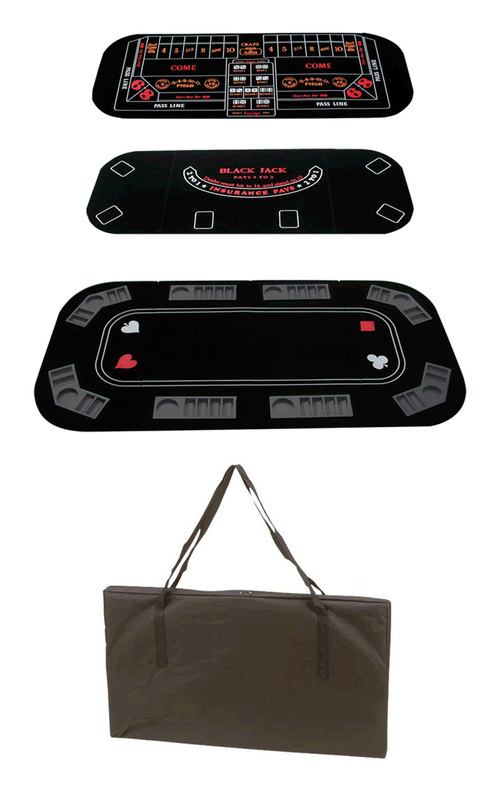 This fabulous set includes Three games tabletops: Texas Hold’em , Craps and Black Jack. Also included there is a carrying case convenient for traveling. The set measures 66” W x 33” D.
With 3 different casino games, this 3 in 1 game Table Top can entertain as many as 8 players. It's traditional design is coupled with 8 individual trays for beverages and poker chips. A casino quality black felt top provides for a smooth playing surface. When fully opened, the table extends to 63.5" long and 31.5" wide. It folds conveniently for storage into a compact 31.5" by 16" bundle. A heavy duty nylon bag with a durable strap handle is included for easy and convenient transport and portability. Open: 66" x 33" x 0.78"
Folded: 16.5" x 33" x 3.15"